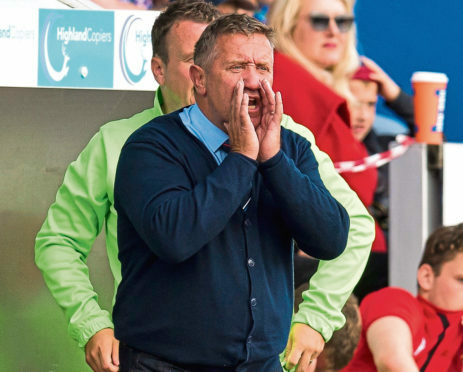 Caley Thistle manager John Robertson has challenged his players to bounce back from their poorest display of the season when they host Morton in the Championship today. Inverness were held to their second successive goalless draw at home to Queen of the South last weekend, in a match largely bereft of scoring opportunities. Although the result extended Caley Jags’ unbeaten league run to 18 games, Robertson feels his side slipped below their own high standards and he has called on his side to deliver a slicker display when they take on the Greenock men this afternoon. Robertson said: “We had a brief chat after Saturday when we were all disappointed, but didn’t dwell on it too long. “The staff, players and fans were all disappointed but it says a lot for the team that we’ve probably had our poorest game of the season and we didn’t lose the match. “We’d have lost the game last year and didn’t this year. “We have just concentrated on getting it upbeat this week and being a bit sharper in everything we’ve done. Morton are still searching for their first victory under Jonatan Johansson, who replaced Ray McKinnon at Cappielow last month, with Ton making the trip north today on the back of a 5-1 defeat against leaders Ayr United last weekend. Robertson, who remains without the injured George Oakley and Angus Beith, is wary of a backlash from Caley Jags’ opponents, adding: “Jonatan has been in the job for a wee while now and he has good pedigree, coming through the ranks at Rangers. “He’ll be a good, progressive young coach, full of ideas, and he has a very wily fox with him in Peter Houston who I know very well. “They will come here on the back of a bad result against Ayr United. Teams who have lost a few goals will stiffen up at the back and work on defensive aspects.